There is so much more to the United States of America than Disneyland and Hollywood, New York City and Los Angeles, including varied rock art traditions from east to west. Along the east coast there are many wonderful and important historic sites that relate to the arrival of European colonists and the founding of modern USA. From the midwest to the vast open, spectacular natural landscapes of the southwest are some of the most intriguing prehistoric sites of Native Americans. Although the America’s were the last continents to be populated by humans, there is still considerable debate about the timing of the movement of people from Asia and their subsequent spread throughout North, Central and South America, as well as the routes travelled. That said, archaeologists recognise three broad periods in the prehistory of the United States of America – these are broadly similar to those used by Canadian archaeologists, but differ to those used for the past in Central America – specifically the later periods. The earliest period is the Lithic Stage, also called the Paleo-Indian period. Paleo-Indians, or Paleo-Americans are the first inhabitants of the continent, and this period refers to that time before about 10,000 years ago. As the name Lithic Stage implies (lithic = stone), it is marked the presence of the first flaked stone tools. 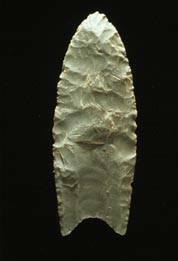 The most well known example of this period is the Clovis Culture and its distinctive projectile points. These first Americans were big game hunters, and are believed to have followed migratory herds of bison and the like onto the continent and then throughout the continent. The second period of occupation is known as the Archaic period, and lasts from 10,000 years ago until about 4,000 years ago; although exact dates vary across the USA. The end of the Archaic period is marked by a shift to a more sedentary existence, and becoming farmers – increasingly harvesting local resources and domesticating plants and animals. From 4,000 years on, the Post-Archaic period, the archaeology of US regions begin to vary quite noticeably, and continue to develop in markedly different ways. Compare for example the cliff dwellings of the Basketmakers and Pueblos in the southwest and the urban settlements with large earthwork mounds at Cahokia further to the east in the Mississippi Valley. By the time the Europeans arrived in the east, Cahokia had been abandoned whereas Pueblo Indians were still thriving. The colonisation of the Americas by the Europeans had different affects on different groups, and this is an area of substantial archaeological research in the US. The USA has some remarkable museums with spectacular exhibitions of the archaeology of the Americas. This is partly because much of the pioneering archaeological research in North, Central and South America was conducted by archaeologists based in US Universities and Museums. These museums have also sponsored research and excavations in other parts of the World, as well as acquiring objects through sale. Consequently, there are also substantial collections and exhibitions of Egyptian, Classical Mediterranean, Near Eastern and Far Eastern artefacts. The official travel website for the United States of America, with extensive and detailed information on attractions around the USA. Find information on the National Parks in the USA.